Cast: Orson Welles, Joseph Cotten, Dorothy Comingore. Charles Foster Kane (Orson Welles) utters the word ‘Rosebud’ with his final breath and the film deals with the attempts of friends and acquaintances to unravel the meaning of it via flashbacks of his life. As we dwell on the dying lonely man’s words we are transported into his life as a successful newspaper publisher, who built up his empire from humble beginnings to become one of America’s most powerful businessmen. However he learns that success and happiness doesn’t always go hand in hand and this soon becomes apparent as Kane begins to lose the power he has become accustomed to and his empire begins to crumble. 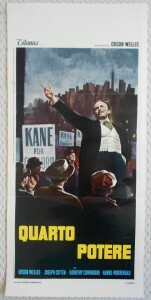 The film is said to have been based on real-life newspaper publisher William Randolph Hearst. This was never proven although Randolph wasn’t best pleased with this film. 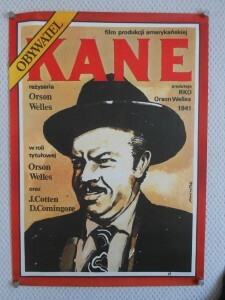 Welles was clever enough to amalgamate several traits of different well-known paper men which made it impossible to prove the film was about Hearst. So what of Rosebud? The secret behind the word is revealed right at the end and after so much searching during the film, it is somewhat of a surprise.